Welcome to Keep It Real Friday for September 26th. I could tell all of you how great the Dallas Cowboys have played, but I'm waiting for the playoff win. Maybe we could discuss how the winner of the Big 10 Conference gets a box of donuts and a trip to a BCS NON-Championship Game. But instead . . . I can't believe I'm doing this, people are going to start confusing me for a Patriots fan, but it's true, the loss to the 'Fish' was a FLUKE! For the first Sunday in what seems like two years errr, maybe because that's how long it's been, the Patriots defense looked very, very, old. They didn't adjust at half time, they forgot how to tackle, and most importantly they forgot what it was like to play defense against a college football team. Miami tried something that WON'T become a trend in the NFL, by Tuesday morning every defensive coordinator in the league had gone over game film of the Pats v. Dolphins and re-taught how to defend against a single-wing set. Ronnie Brown had the game of his life (17 carries, 113 yards and 4 TD's), a game he probably won't duplicate. I don't believe any of that crap about the Dolphins having the Patriots number, they have a good coach, had a great strategy, and executed to perfection. Can I ask where that was against Brett in week 1 or how about the Cardinals in week 2? When ya got thrashed! The Patriots aren't doomed, but they do need to get back on the field and prove people wrong after that performance on Sunday. Maybe Randy will go back to Randy before New England but it remains to be seen, people are very willing to jump on him in Brady's absence, it's a little strange. Then again, O.J. could save three children from a burning building and he's till be O.J. to me. Wake me when the Dolphins go .500, then we'll talk. Several weeks ago, in this same segment (Keep It Real Friday), I dropped my pre-season Heisman Trophy winner, Texas Tech quarterback, Graham Harrell. Not a terrible prediction, he is currently leading the country in passing yards (1,573) and has only thrown three interceptions. However, while I mentioned Sooner quarterback, Sam Bradford, in that same column, I may have overlooked a very important part of the Heisman voting. Ohio State, Florida, USC, Oklahoma, Michigan. Those are the type of schools that get Heisman nods, not a school in Lubbock, Texas. My new Heisman front runner fits all the categories. Missouri quarterback and 2007 Heisman finalist, Chase Daniel. For starters, he covered a 26.5 point spread against Nevada by dropping 69 points on them. In my books that's money in the bank. Second; He's third in the country in passing yards at 1,412 and has thrown the ball 53 less times than front runner Graham Harrell. Daniel has a games on October 4th at Nebraska, and October 18th @ Texas, if Missouri survives those two, he has the HUGE wins that propels his candidacy. The previously mentioned Bradford and Harrell are great competition for Chase Daniel, if Missouri can run the table in the Big 12, just try and keep them out of a BCS Bowl Game in 2008. A game which will showcase the newest member of the Downtown Athletic Club, Chase Daniel. One of my least favorite people to discuss, Hank Steinbrenner. "Now you see the flaws of a multi division setup. Everyone in the Media is pointing out that it looks like Joe and LA are going to make the playoffs, while we're not. Look at the division they are in, If LA were in the AL East it would be a different story"
Well you are in the A.L. East Hank, and shocker your not in the playoffs. You've got no minor league pitchers ready to make an impact, are prepared to spend major dollars on an overweight pitcher whose been dominating in that OTHER league you defecated on, and have no idea what to do with Joba Chamberlain. The most evident thing was watching Torre, your former manager celebrate like a little kid in the Dodger clubhouse last night. Torre said "when I came here, I wanted to see if it could be fun again" Congrats Joe, because you know what isn't fun? Going home at the end of September, like your old mates! Back to Hank's theory: If it wasn't for that divisional set-up, the Yanks streak of consecutive playoff appearences would have ended last year, when they were the wild-card. What do you contest Hank? We should just take the two teams with the best records over the entire season and have them play a seven game series for the championship? NO playoffs at all? Then again, this is coming from the guy who plans on charging people a quarter million for season tickets, so can we really think he cares about a playoff for the fans? Hank is childish, not only is he taking digs at Torre and the Dodgers, he also left the greatest Yankee manager of all time out of the Yankee Stadium tribute. Just another reason why the Yankees are the Yankees, and everyone not wearing pinstripes can't stand them. Keep it Real Hank! Torre is going to October, and you AIN'T! All this talk about the President has got me thinking . . . Who would be better than President Pierce! He is the comeback kid, carried off by his teammates, only to return and lead his team to victory! The Celtics veteran has staying power, he's seen the good times and the bad. He'll have his number 34 in the rafters alongside Bird, Russell, and Cousy! 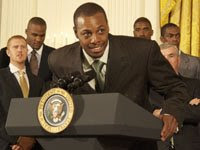 Vote Paul Pierce in 2008! Finally, here are some things I'm calling for. 5. MLB grants the Cubs auto bid to the Fall Classic, win/win. 4. All Big 10 football to be disqualified from BCS Bowl Games. 2. If the Mets blow this, they are forced to play in Shea for another year. 1. Group firing in the NFL, Crennel, Lewis, Linehan, and Edwards, 1 Day.